From the May 10, 1937, issue of Life magazine. Love the use of spot color in this. Starting off 2011 on a scotch roll, it seems. I received a package just before Christmas containing review samples of Jura and Dalmore scotches. I’ll be reviewing the Jura samples this week, and the Dalmore next. Jura scotch comes of course from the island of Jura located to the northeast of the island of Islay. Jura’s most famous resident was probably George Orwell, who lived there near the end of his life while writing 1984. The scotch named Jura is the only whisky distilled on the island. Tasting notes: Very mildly smoky, very mildly honeyed. Salty. Bit of resin, like pine. Hints of dark chocolate. Salty finish. Final word: I’m a little biased here. When I want a scotch that’s well-balanced — neither smoky nor floral but a bit of both — Jura 10 is usually one of my choices. 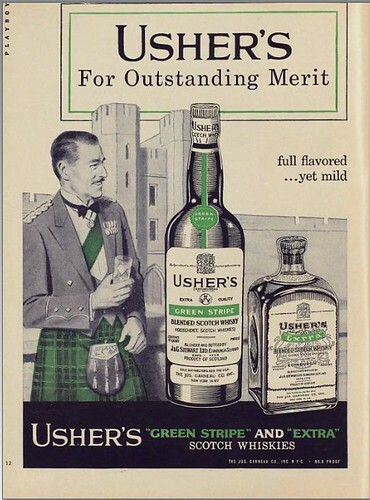 It’s one of my favorite sipping malts, and one I like to recommend to people new to scotch. Tasting notes: A little peatier than the 10, but still not heavy peat. Less resin than the 10. Honey gives way to dark chocolate and vanilla. Same salty finish. Final word: Definite step up from the 10, still very tasty and balanced, but smoother. I like the subtle upping of the peat flavor. 45% abv. Blend of two or more Jura whiskies–one peaty, one not. Nose: Light peaty smoke, some sherry nuttiness. Tasting notes: Again, light peaty smoke, heather, hazelnut, nutty cookie, like a Pecan Sandie. Long, mildly salty finish with a bit more smoke. Final word: Lovely dram, and definitely something I’d seek out for my home bar. 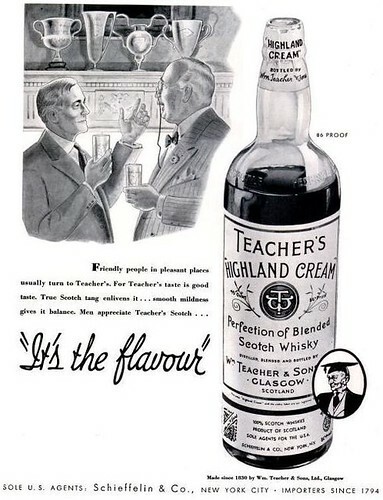 Since the smoke is there but mild, this might be a good whisky to introduce to someone who’s never had a peaty example. At roughly US$50, not a bad bargain for the price. Nose: Big peat. Subtle fruitiness, but I can’t pin it down exactly. Nutty spices. Tasting notes: Most complex and nuanced of the lot. Peaty smoke dominates. Something medicinal in there, but pleasantly so. Iodine? Hints of cinnamon and clove, subtle fruit (again, can’t quite pin it down). Medium finish. Final word: Oh my darling, where the hell have you been all my life? Let’s listen to Tom Waits and get dirty together. From the April 26, 1937, issue of Life magazine. There’s a liquor retailer in the UK called Master of Malt, and despite its name, it sells more than just whisk(e)y. In the summer of 2010, they started a program called Drinks by the Dram, wherein they’ll sell you little sample bottles of many of their products–from low-end to high. The samples are 3cl/30ml, or a little over an ounce. The goal is to provide a try-before-you-buy program, allowing consumers to buy small drams at reasonable prices, so that they may sample unique and hard-to-find bottlings without paying possibly hundreds of dollars for something they may not like. Highland malt. Bottled at cask strength, 56.9%. Distilled and matured in 1998, bottled in 2009. Sassicaia is an Italian wine, so this means it’s aged in wine barrels to pick up some of that flavor. Fewer than 500 bottles of this were released. Color: A pale amber with reddish undertones. Nose: Floral, spicy, sweet but not cloying. Tasting notes: Well-balanced scotch. Hot, in keeping with its barrel strength. Drying. Notes of chocolate and stone fruit, the latter probably from the wine barrel. The stone fruit reminds me a bit of cherry. At this strength, it definitely needs some water. Moderately creamy texture. Subtle smoke. Final word: At the price point (£41.97, or about $70 US) for a 500-ml bottle, there are better scotches on the market. Nuff said. Does this require a review? I think they’re including it mainly to show that their samplers cover a range of whisk(e)y styles, including high-end blends. I know next to nothing about this. It’s from something called Master of Malt’s Secret Bottlings Series, which bottles scotches from undisclosed distilleries. Nose: Walnut, pecan. Butterscotch, toffee, honey. Tasting notes: Candied nuts, hint of smoke, honey, malt. Fresh and light, with hints of lemon and grass. Moderately bitter on finish. Final word: Tasty example of Lowlands style. At £34.95 (or about $58 US) for 700ml, might make a nice present for a scotch lover who’s a completest, or at the opposite end of the scale, for someone fairly new to scotch, since the Lowlands style tends to appeal to beginners. Single-malt Irish whiskey is a category that seems to be little-known among US consumers. Shame, if this one’s any indication. Single-malt Irish whiskey, 46% abv. Nose: Malt, hint of spice, caramel, chocolate, white pepper. Nose opens up over time. Tasting notes: Not winey, despite the sherry finish, but there is a hint of stone fruit and sherry-nuttiness, possibly from the cask. Dried fruit–apricot, maybe. Rich, well-balanced. Final word: Delicious. I’d drink this often, if I could find and afford it. I want to linger over the precious grams that remain in my glass. Master of Malt offers this for £49.14 for 700ml, or about $81 US. Single-grain Irish whiskey, 43% abv. Tasting notes: Chocolate, vanilla, honey, bourbon. Final word: Would recommend for bourbon drinkers branching out into single malts. Very smooth whiskey. Definitely lighter and sweeter than most single malts, so a good stepping stone to single-malt Irish and Scotch bottlings. The grain here is corn, with just a little bit of malted barley to start the fermentation process, according to the Cooley Distillery website. Aged in bourbon casks. The 15-year retails for £52.45 for 700ml, or about US$86, but Greenore also makes an 8-year that goes for about $50. 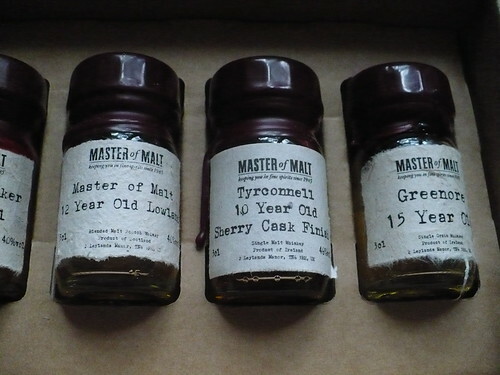 I really enjoyed sampling through these whiskeys, so I think Masters of Malt has a good program going here. These wee bottles would make great individual stocking stuffers. A multi-bottle sampler box would be perfect for the aficionado who’s looking to try new bottlings. From the October 25, 1937, issue of Life magazine.